Bushtracker Forum Forum Index -> What SIZE OR TYPE OF BUSHTRACKER? Hello, Steven Gibbs here, Director, Bushtracker, my van is out on the largest size that is practical. I ran a POLL in this spot, and 96% of you that voted wanted to see the interior and innovations in the "Directors Own". 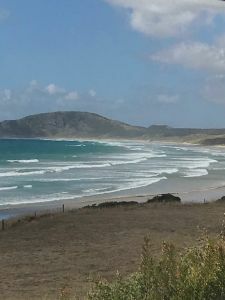 I am currently in Tasmania on a good 10 week Holiday, so I will have time to share more with you. 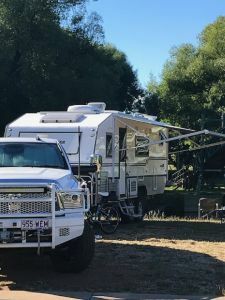 My own Bushtracker, is home away from home, and luxurious, and I like to feel like I can homestead anywhere I pull up, but: It also is going to take a specialized tow vehicle to do it, OK? First the tow vehicle so you will know what you are up against, then my choice of layout with pictures of the interior, and then I will show you some of the innovations. My vans all are used to test new concepts and innovations in equipment in the field. We actually test things, empirical testing in the field Outback. This van has some huge innovations, because of the extreme size, like it can run the air conditioning of Lithium batteries. 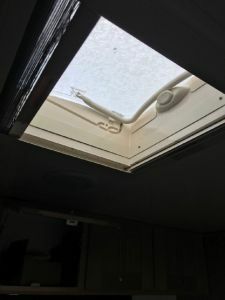 Many claim to do that, and they can, but then they can take up to a week to recharge the batteries because all they offer are flat plastic panels glued to the roof that suffer heat degradation in output. Their system only works once, and then has a difficult time charging up. Their generator run time would about equal the air conditioning run time in the first place, so their system is just a sales gimmick. Here, ours works, but it is relative to the size of the Bushtracker. 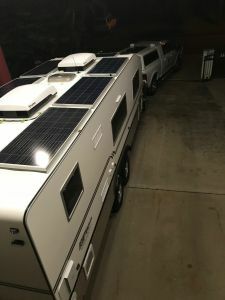 I have a 23' Bushtracker that can support 6- 150 Watt solar panels on the roof as well as two air conditioning units, and 600 AH of Lithium Batteries, and three ways to charge them. My system can run independently all day or about 5 hours at night. Further to this, I am going to do some major Expeditions this year, like Tibooburra and west through Camerons corner, then into gold country south like Arkoroola, Andamooka, and along the Pacific/Indian Transcontinental rail line service road and south... Now off road, nothing beats the double rear tyre drive, Dual Rear Wheels, DRW. A DRW limited slip, is the next stage beyond 4x4, it really digs like a 6x6 if you have enough weight on the back and I will... I have a bed slide out in the canopy, tools, fuel tanks, and fridge-freezer and 200 more AH of Lithiums in the bed of the truck, 200 watts of solar on the roof of the canopy, a long ton of gear..
Now with single drive rear end, I would be limited with a really large van in 4x4 in soft sand, dirt and rock, mud and so on.. Don't get me wrong, for normal Bushtracker travel this white Dodge Ram Cummins diesel is just fine. But where I want to go on expedition, I plan on getting into some rougher terrain, and the larger van will be compensated by a Dually (DRW). I have owned Dual Rear Wheel (DRW) or Duallies for most of the past 15 years, and because of the size of this van I am going back to a DRW. This is my own personal largest Bushtracker, and I will need it. 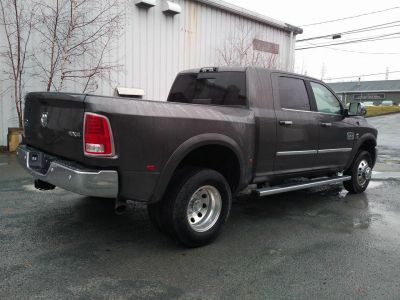 Here are pictures of my new Longhorn Mega Cab Dually coming about April. The Dually will dig well as I will also carry 500 litres of diesel in 3 tanks, for about a 2500 km range to support the expedition. These pictures are not my exact truck, but it will look like this. Mine is a Longhorn, with air suspension over, in the rear. Now this may not be your cuppa tea. OK, I get that. But this is my choice, like on StarTrek "Going where no man has gone before" and I will be doing exploring for relics and gold nugget fossicking. What this Topic is about is to let you know what it takes to tow a really big van off-road. My own Bushtracker is heavy, on full Air Suspension, and a half ton of innovations and half ton of water.. I think 23' is about as large as is practical in extreme off-road, and only then does the DRW Dually shine. I will go with this white SRW (now in Tasmania) until my Dually gets here, but the Dually with a limited slip rear end, actually digs harder more like a 6x6. You can see some examples of that work with Dual Rear Wheel (DRW) rigs off-road in 4x4 on some of our DVDs in the past. Here is the basic layout pictures in my own Bushtracker. It is the same sort of format, that is the most popular style of all of our layouts, with many variations.. It is about the same as my last Bushtracker, a 21', only I stretched it out to 23' for a couple of new layout ideas I wanted to incorporate into the design. 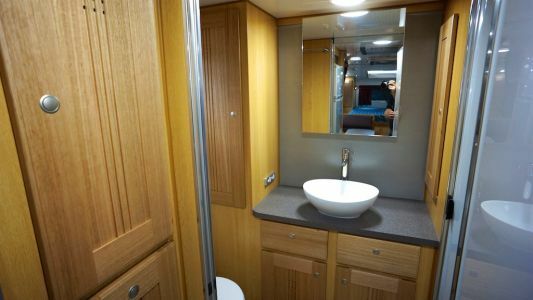 Here looking back, dinning on the left, galley on the right, back to the full width ensuite and dressing room to the rear through that white perspex door..
Queens sized bed in the front, with lockers, shoeboxes in the floor, so it is raised up and the bed has the feel of a normal height from each side. Hanging lockers each side, star gazer hatch on top.. Through the door at the back is a full width dressing room and ensuite..
To the left, the loo, and to the right the shower door and shower. I had it made a few inches larger just for luxury.. 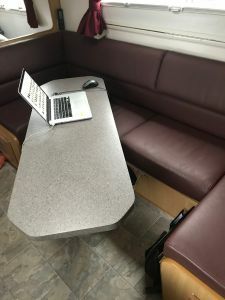 So what is different about the layout to need to stretch the van 2 feet? 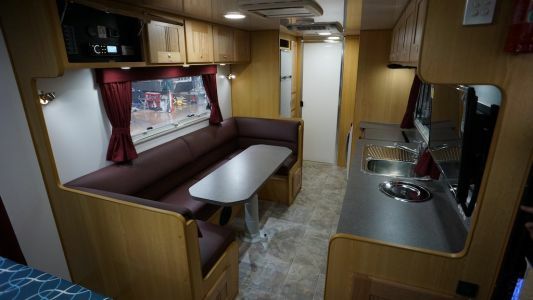 On this side is a large dining area that seats four big people. 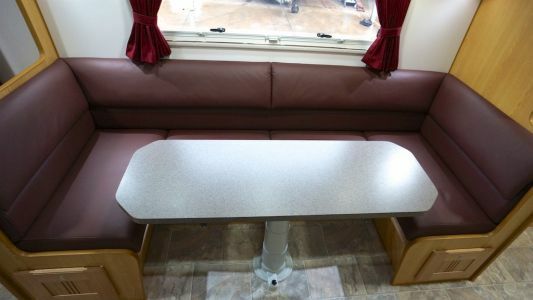 The table has a lever that makes it shift four ways, left-right, and in and out, and also a foot lever on the floor that makes it drop to a bed. 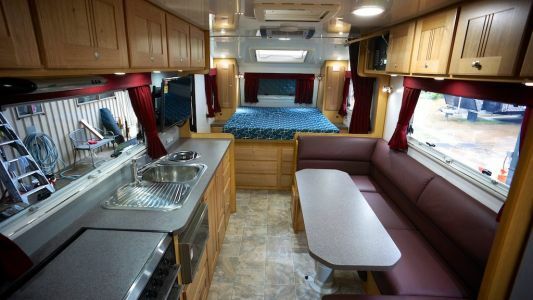 My Wife wanted to have a large dining area, four could sit and eat or play cards, and a large bed if our Kids came for a visit where ever we were.. That was the use of the added 2' on this side..
Then, something I found I liked on the French Cruising Yachts, a drop through in the counter to a full sized kitchen bin under.. More on this one later, but I love it!! You can have a wood chopping block cutting board on the sink, and no messy hands trying to clean up, it all goes right down into the trash bag lined big bin. 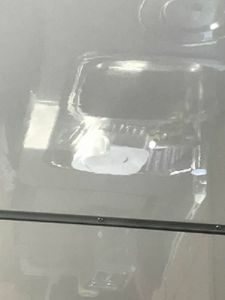 When full, it gets pulled out, wrapped up, with a new plastic liner in it, and the trash bag put in the truck for disposal. I will start putting on a few of the details, OK? The French Yachts have this drop through into a full sized bin. 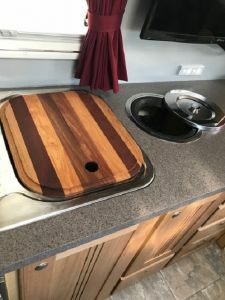 The cutting board fits the top of the sink, OR the drainboard. So for cleaning and cutting and trimming food, the drop through is amazingly handy. This is not my original idea, I stole this from the French, and love it. 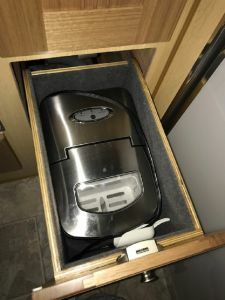 Not only does a full sized kitchen bin with a plastic garbage bag liner work well to manage trash, but you are also not accessing it with dirty hands. The top is made to be a hot plate to sit a hot pot on as well. 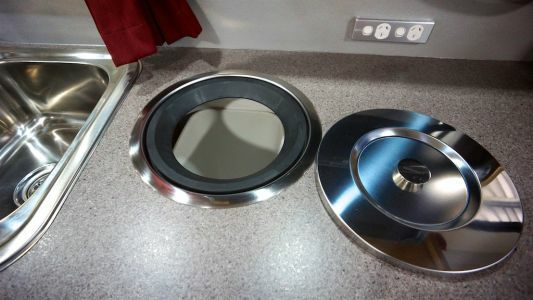 If I put the cutting board to the left on the drain side, I have use of the sink for washing, vegies, meat, what ever. This drop through bin was HIGH on my wish list OK? The other foot I had to use, was put alongside the stove for one of my little joys in life... My coffee machine. I love the smell of the roast beans grinding, and even though I mix it 3/4 decaff, I really still enjoy that morning coffee. We made this tray and lock down system for it.. Here is another personal choice and selection. 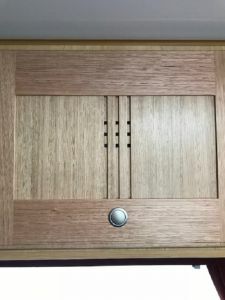 First of all I like the 9 hole style of cabinet doors in Tassie Oak.. They are still a little fresh, pink in colour, they turn the golden oak colour in a few months exposed to the UV (Ultra-Violet light). Anyway, the nine hole offers ventilation to the lockers. Also note the height. These are BIIIG overheads. How and why? I raised the roof on the overall Bushtracker by 75 mm, so these overheads are that much larger. I may end up putting shelves in them, or some. After this ten weeks in Tasmania I will decide. The raising of the roof, is not only a great feel, but it makes a looong Bushtracker seem shorter in perspective. Really, I do not find the 23' too long, nor think I will be handicapped off-road. It is far more about the tow vehicle than the size of the van. 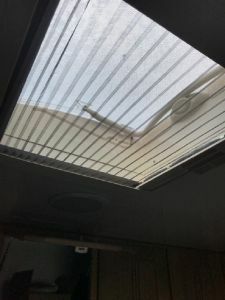 Right Oh, here is another one: Our full aircraft style frames, full 75mm insulation, but on the inside a one piece fibreglass semi gloss ceiling. I love how it looks, but like many things on my own van it is a weight penalty. 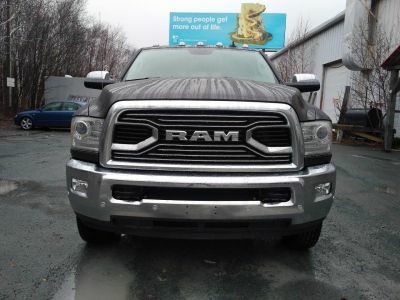 However, with the Dodge Ram, the tow vehicle will not know the difference and I like the look of the glossy easy to clean fibreglass ceiling. Here is another choice of mine: This table leg, has a four way, five way adjust. 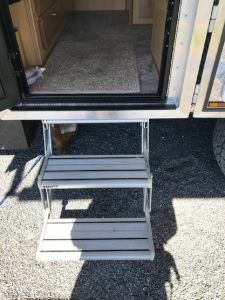 The lever in the front left allows it to move in and out to lock, and side to side to lock, and the foot button on the floor allows it to drop to make a bed. I love it! The mirror in the dressing room of the full width ensuite, has now been adapted to be a medicine cabinet behind. 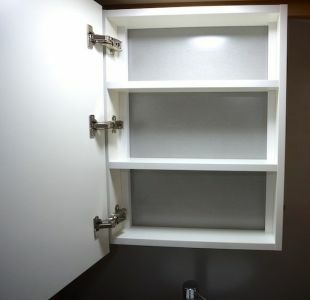 You still have the lockers left and right, but this is a handy addition.. Since this Tasmanian trip is only a Holiday, but the real travel is in the Outback with a DVD trip in really rugged and remote country that looks a bit like the Kimberlies: I opted for the full Air Suspension. There are Topics on this, but it is the best in Australia, and on 4140 Tool Steel 60 tonne Tensile axles. I love playing with it in manual mode, leveling the van side to side and front to back. It also makes this heavy Bushtracker float along nicely.. Combined with this flexible hitch, it is quite a manageable ride. 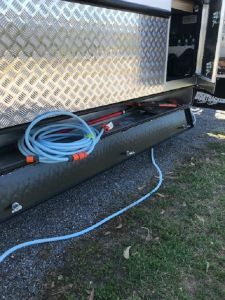 This hitch is an inexpensive alternative to the Air Safe, on rubber torsion bars. It tows well.. And it and the heavy duty (Tailgators bumper) will go on my Dually Dodge when it arrives. 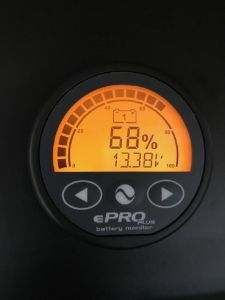 This is our new E-Pro Battery Management System readout. It is a little more elaborate, updated, and manages my 600 AH Lithiums that will nicely power up one of my air conditioning units self sufficiently in full sunlight and 4-5 hours into the night. More on that in the future, with an additional twin charging system off the truck. 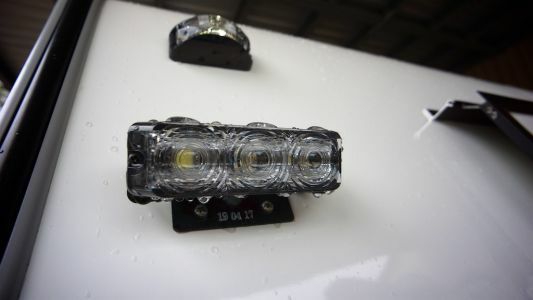 I have the "Double Buzzard" lights on the back of my Dodge for back up lights, again super bright big LED.. 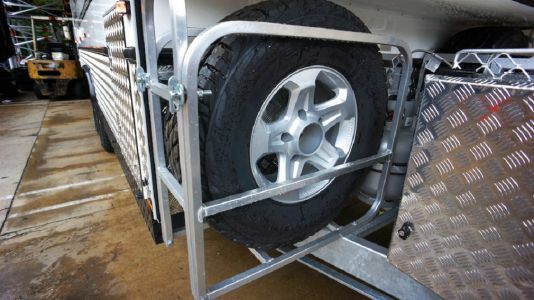 I have opted for the tyre carriers with the ramp, the tyre cages with the fold down ramp.. 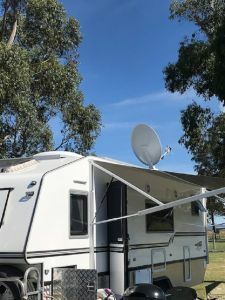 I also really like the Oyster Auto Deploy Satellite Dish for Foxtel and all the movie channels and world news, maybe a 100 channels, National Geographic, everything.. 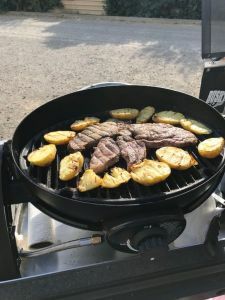 This is a nice treat, it is a slide that comes out about 2 meters, but it also goes each way, each side... BTW, this is also my choice in BBQ, I think better than the Weber, this is the Ziegler & Brown. I prefer it because I think the burner is better, and the lid folds over itself to underneath. 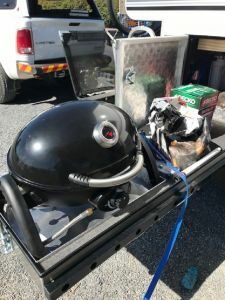 You might just check it out before buying the Weber. Mine is bolted down on the slide out. And of course, I love the power fold out stairs. Not only does it go lower, but it is really fun to deploy. It is protected in the front of the suspension, but I would not advise it for behind the suspension... Works a treat and is fun to put in and out!! 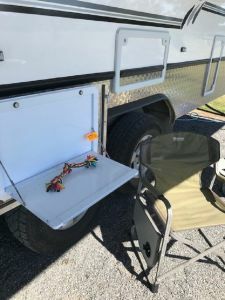 Here are another couple of options, the Lifestyle table, that has matching checker plate body armour on the outside, and it works really well mounted on the water tight door. Also to the right of it you can see the external A/V locker with another TV. Matthew optioned that on, while I cannot see using it, he thinks it draws a lot of attention as a Show van, OK.. When I have Foxtel, I cannot see any reason to have the local channels as I get all of them on the 100 Foxtel Satellite channels, heh? So I am thinking maxi solar, Wineguard antennae can go? 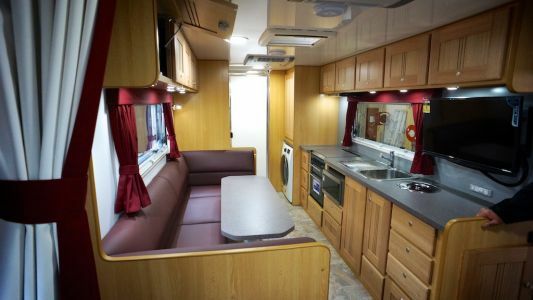 On this one, I chose some stainless appliances, and had drawers built to take them in size.. 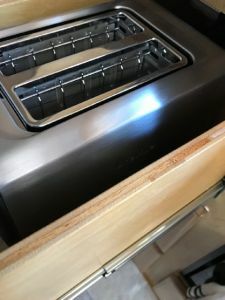 This is a stainless high grade toaster, and an ice maker... And notice these deeper drawers have to have the sides done in Marine Plywood, edges varnished, waterproof glue, and the predicater for Marine Plywood, no voids ..
Now Size Matters, and I have two air conditioning units, the most power efficient and quiet, the Truma Aventa II. Not only do I have redundancy if one goes down, as I have a medical condition and cannot sleep in weather over 30 C, but also in really hot weather, two will do the job in a 23' Bushtracker.. In between them I am trying the Mini Heki hatch. 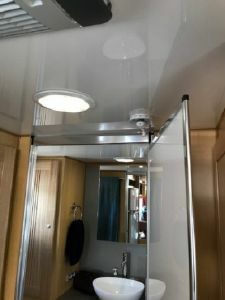 It opens, is a gas hatch, and has very nice accordion blinds and screen..
Kind regards from the lone Ranger, "Scouting the trail ahead for you".. and PSS five others like my crazy idea so we have ordered 30 of the heavy duty steel wheels for 8 stud for this new breed of MEGA YACHTS... Land Yachts..
23' is a BIG RIG from this angle, here at Bay of Fires in Tasmania..
More on some of the equipment and features on this Bushtracker "Mega Yacht". First of all a few more comments on the Mini-Heki: I really like it. I mean the Fantastic sort of thing with the big 10" fan works well, but this is quiet and power efficient, and opens up quite large. It is very easy to use, one handed, and has very easy to use accordion screens and blinds. 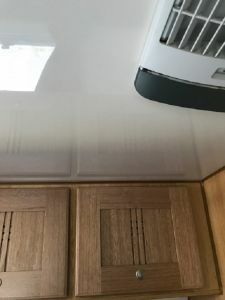 I have noticed that in cooking it takes out a lot more cooking odors and steam than just with the Dometic rangehood alone... 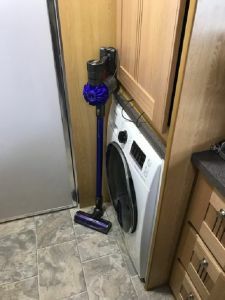 It gets a big thumbs up from me, my first Mini-Heki and I think it will be a standard for me personally, mid van and near the stove it works a treat. 1) Most don't need it, added complication and operation, and potential maintenance with air lines and fittings, and just a waste on smaller vans for no reason, financially and physically, OK? 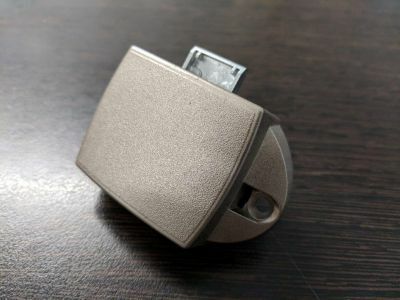 Other people use it as a Sales Gimmick, but really it is added expense and weight and maintenance for no valid reason. 2) It REALLY is not necessary for the smaller vans, and if they are weight conscious or tow capacity conscious, it weighs more.. Like 60 kg or so, that they do not need. It is more of a Sales Gimmick to run Air Suspension on the smaller vans. I mean all of our suspensions are more heavy duty than the same types our Competitors use, and all have the 4140 Tool Steel 60 ton Tensile axles, but it is not worth the weight and expense on smaller vans, no reason... On the smaller Bushtrackers if you think you need a softer ride you can use the coil and shockie suspension, with all the features of the above, and 75% as soft as the full Air Suspension, OK? 3) For the serious 4x4 People, gold fossicking, fishing in remote places, intrepid explorers and such, our Standard Suspension has more wheel travel, and is Load Sharing, it is far superior off-road to both of the above and anything our Competitors even offer. Now having said that, the Mega-Yacht style of travel does benefit greatly from the full Air Suspension. You can use the air system to level the larger Land Yachts, in more extreme situations you are stuck with that would be hard to mimic without it on, leveling up a large heavy 23' Bushtracker. 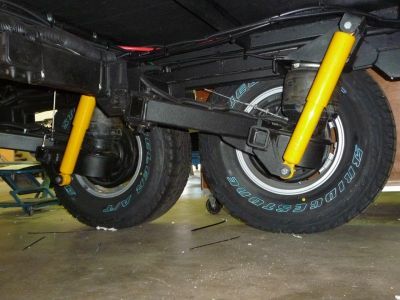 On larger Bushtrackers, the coil and shock suspension is really good for the corrugation and 75% as smooth as the Air Suspension, but money no object if you are not on a budget, the Air Suspension has an important luxury feature of leveling the Bushtracker side to side and front to back in a really bad parking location. In this example, what you are looking at is actually a tent site... 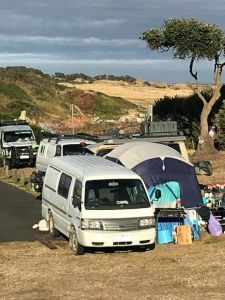 I backed it up at a steep side to side angle in this overcrowded free camp, to take advantage of this high set tent site with an Ocean View!! Now what you cannot see is the other side is up on the steep bank. 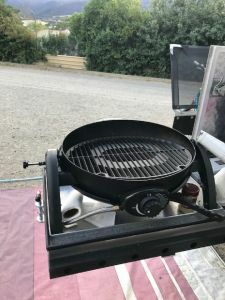 This allowed me to be partially on the camp site, tent site, but back away from the rock fire pits. I lowered down the Air Suspension all the way to the bump stops on the other side, to level me up side to side, and used the down leg in the front to raise me up level, even still hooked up... And was it ever a great view. Anyways, this is just an example: SIZE MATTERS, if you want the extremes of Luxury, and have the tow vehicle to match it OK? Cold and windy down in Hobart... Christmas Eve is forecast to be 9 C and hit a high of 16 C.. That is cold to a Queenslander, very cold. On with the Bushtracker coats!! 15 C right now, will hit a high today of 21. Anyway, on with some of the details and innovations on my own personal van. My own personal choices, not for everyone for sure. This is not a skite, but on a Poll 96% of you wanted to see what I chose, the person that can have anything. I went for Mega Land Yacht..
Against? WEIGHT and SIZE are the big issues. For me, it is great, home away from home. My Samsung Bubble Wash machine is super luxury, 7.5 kg and 4-5 kg dry. I get two showers and a day of water plus a load of laundry dried, on one take. 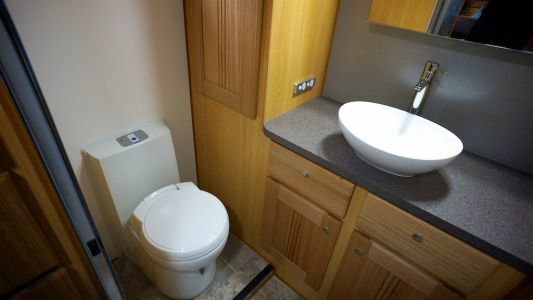 So if you are on power and water and grey water discharge, this is silent and quiet luxury. It is conveniently located to just bung in your clothes after a shower as the dirty clothes hamper as well. Everyone would love this, but it weighs about 69 kg !! That is not an option for smaller tow vehicles.. But what a nice luxury, quiet, and sings musical tones when it is finished. The size and weight allows you to have massive power capabilities as well. 600 Amp Hours of Lithiums, and 6-150 watt panels of solar, means at peak solar the air conditioning runs for free... (forgive the little dirt from a bucket put up there on the Lithium batteries in the foreground). 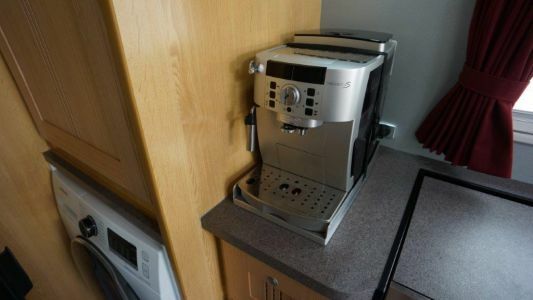 This means you can live with luxury appliances with no noticeable power consumption, like my stainless coffee maker, stainless toaster, and stainless ice maker luxuries. For the extremes of Lifestyle, SIZE matters. 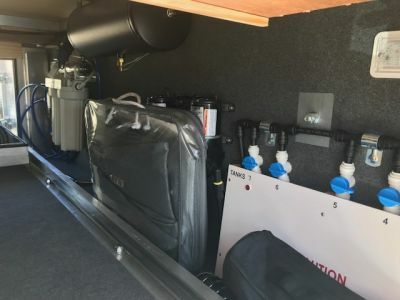 Here in the front, I have easy access to the tank filling selections, and the Water Sterilization system, and the dual water pumps for potable and non potable systems, and a marine carpeted storage area.. The Slide out goes either way, with cargo on board, BBQ all the way out in this picture. 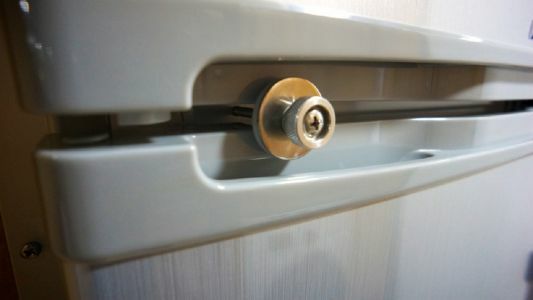 It also comes out on the off side for access to stored goods..
Now, don't get me wrong. This kind of extreme size is a problem and handicapping in a tight place like Tasmania. I am told the drive to Queenstown is narrow and winding with a steep drop off on one side, tight on the other. I am told it has beautiful views, but you cannot take your eyes off the "tarmac" as they said, because of oncoming logging trucks. That and they said there are supposed to be 91 tight curves, but "They only counted 87" My Wife has a bad back and may need surgery, that and my rig is 16 meters long, I can give that drive a MISS !! 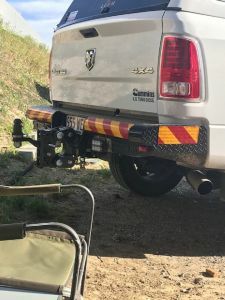 This Dodge Air Suspension system will get me most anywhere in the Outback with limited slip rear end, the Dually will dig like a 6x6 with a long ton in the bed. Anyway, if you are going to have the extremes of luxury and size, you have to plan on the comparable tow vehicle OK? For me, I want to get back into the rough country, that is why the 6x6 effect of the Dually. You can see them in action in some of our DVDs. You can see Single Rear Wheel SRW 4x4s digging and spinning and spitting dirt, where the largest Bushtracker towed by a DRW just glides right over the soft ground and sand and grader cuts and mounds getting around fallen trees on remote tracks. The Dual rear wheels really work. A pain in town, but I have gotten used to it, testing about four Duallies in the past 15 years. 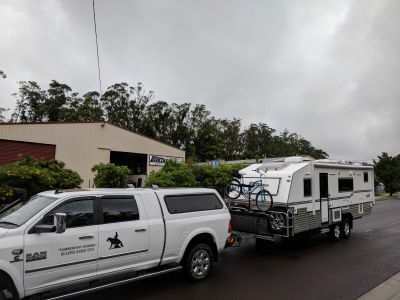 With a luxury van this size, I could do it fine with my single rear wheel Ram, but the Dually will do it better.. Horses for courses, with this new Bushtracker and my plans for extreme exploring and gold fossicking, the DRW will be an advantage. I know I will miss this SRW, especially in town, but the advantages out Bush make it all worth while. In any case, you need the proper tow vehicle for a Lifestyle this big, OK? 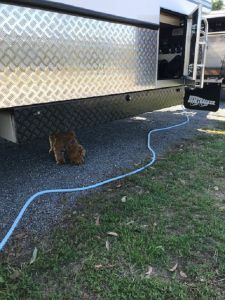 Now there are 50 little things like this, you do not have to worry about, You can see them on a visit to Bushtracker, and you get them in our Standard Equipment. I am going to pass on all those little bits, quality but standard, and go on to deal with the larger choices OK? What do I mean depth? 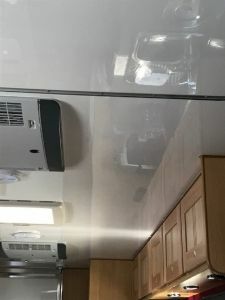 Laying in bed, your eyes see a reflection in the van and it does add depth and makes the van seem more spacious. This is my first one piece fiberglass ceiling, and I really love it. Why do we not do it on ALL Bushtrackers? Three things: Weight, weight, and weight. On a Mega Land Yacht with the right tow vehicle it does not matter. It is certainly an option worth considering. 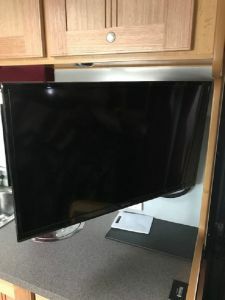 Here you can see the depth in the reflection, easy to wipe clean, and very nice..
Next for me, a Home Entertainment set up.. This is a 32" screen.. It has a new double opposing arms bracket system and does not need to be strapped back. Still folds around to watch in bed.. And runs DVDs through the stereo system. I have whole collections of Series I liked like Hawaii 5-0 and Miami Vice.. As well as full Foxtel with about 100 channels, a dozen movie channels, and all the good ones like Discovery and National Geographic and History channel.. 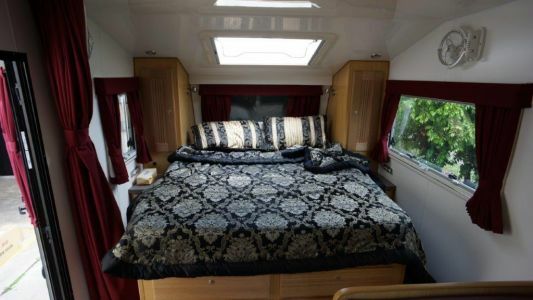 Here shown facing the bed. I mean I do not have it this good at home!! In addition to the twin speakers in the ceiling in stereo, I get the Surround Sound effect with a Base Cannon under the table. You are THERE in an action sort of a movie.. Cold, 15 degree morning, Merry Christmas!! Part two, considerations on design of the Mega Land Yacht class.. 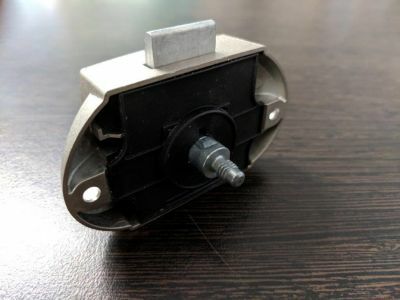 Here is something else, and important with the Air Suspension: Like I was saying above in another Post above on this Thread, while the full Air Suspension is nice, you need to understand that it is more for those that like to tinker. I mean it is just not a plug and play forget it sort of thing. 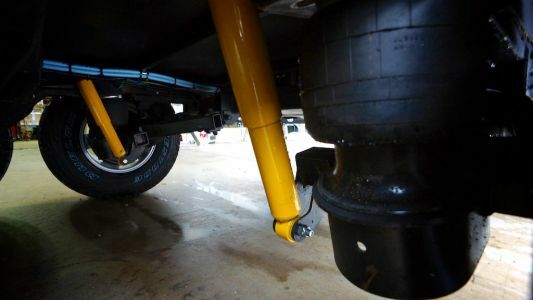 We are recommending the Coil and Shock suspension on larger vans and it rides about 75% as smooth as the full Air Suspension and maintenance free pretty much. But the Air Suspension needs a lot more attention. It is the best in the Industry with the 4140 Tool Steel 60 ton Tensile axle stubs, and it does have the automatic ride height adjustment, so it is the best and the only choice if you want the best. However, it is a bit fiddley..
Now that suits me just fine, as I like to play with it, and it is certainly a major advantage leveling up in bad conditions like I am finding in over crowded Tasmania. 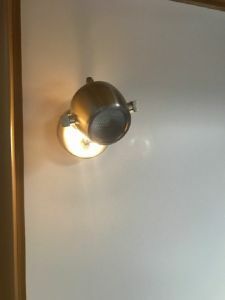 per the pictures above in the extreme leveling conditions. But you have to mechanically inclined and be in tune with it. So what I did was put an extension cable to the outside edge of the cargo hold. 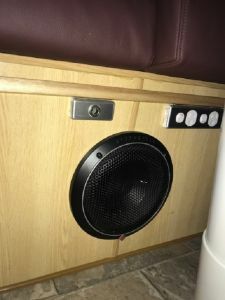 I made a mistake and put it on the off-side, when I should have put it on the near side because I am in there more often with the BBQ and all... :wink"
Anyway, these are mods I suggest you take on board if go the full Air Suspension. It needs to be blown down everyday. It is for someone that likes the toys, but it does need attention. You have to remember to put it back on automatic when you leave, as you level the van front to back and side to side in the "manual" mode. 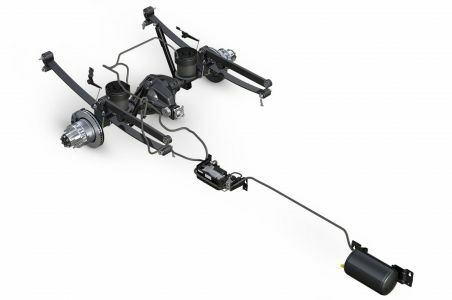 You do not have to adjust the ride height anymore, we are the first ones to incorporate automatic ride height adjustment into the Air Suspension. It all works well, but I want you to be the mechanical minded sort, that likes to tinker with things, if you want it..
Kind regards to all, and MERRY CHRISTMAS from now 16 degree Hobart.. ! Pleased you’re keeping cool in Tassie. This was us in Charleville yesterday. Dash on your previous Laramie shows a warm 41 at 11am. Merry Xmas from Phil and Di. Dunno, that is the other extreme. Not sure I want to be in either radical temperature trend.. 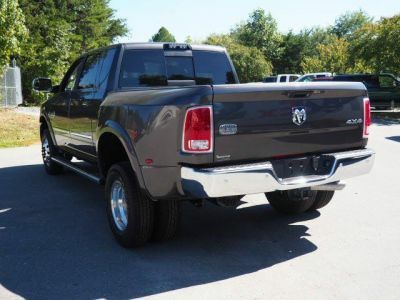 I love the Single Rear Wheel (SRW) Dodge Rams. It is so easy to park up and drive around town, but I have the extreme of vans, and I want to get into gold country and be able to hog it up fossilized creek beds and such off road. The DRW will just be able to do that better and safer. I will suffer around town, but I am used to parking selectively, and backing into parking spots, I mean I have had 4 DRWs in the past 15 years towing and doing R&D. I am used to it. Here is a picture of the actual truck coming. 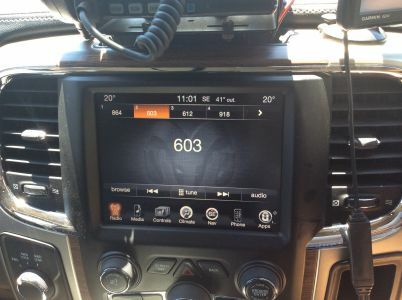 A Longhorn 3500 Mega Cab Dually (DRW). I guess with a big horse float and Mega Bushtracker, I am back to a DRW for good. It will have the same Ranch Hand heavy duty steel bull bar, and this Ranch Hand rear terror to tail gaters heavy duty rear bumper and hitch. It is snow plow ready heavy coils, and I will put the 2" lift in, and all the gear and winch. I will suffer around town, but safer way out in the Never Never. I thought I could stay with the easy SRW, but no. I have developed a new hobby for myself with the MineLab 7000. We will see how it turns out, casual not OCD, just a casual interest for fun. I am having to experiment around with Semi-Retirement hobbies to see what sticks... Anyway, this will be the terror to the P-Plater tail gater.. I guess I am going the extremes on both ends, but why not? 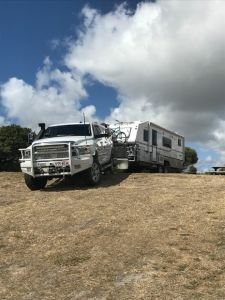 This much Rig, both Bushtracker and tow vehicle, this style is not for everyone. However, my Wife may need the home away from home, she may be debilitated to some degree for years. 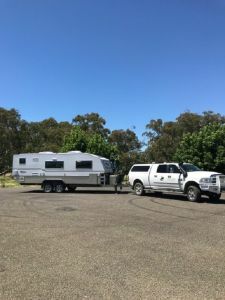 If I can hog our rig into some interesting gold fossicking country, She can be happy while I pursue a new hobby myself. There is motive to my madness. Life is an adventure, and I am going all out. Here is another innovation, a split power system. Like the dual water system of potable and non-potable water, two separate systems. In the case of the water, two pumps, different tanks, no way to cross contaminate. In the case of the split power system, two separate power inlets and circuit breaker systems. Now on Stations, and with Trainers, and mustering for cutting, we did have the ability to run the 4.5 kva gen set. I have had other Bushtrackers with two air conditioners and two power inlets. On this van below, my new Bushtracker, you can see that I still have two power inlets but the technology has greatly improved. I could run a big gen set, and I could plug in both on a Station or Show Grounds, but technology has changed a bit. Having 600 AH of Lithium, I can run one air conditioning unit on just the Lithium system. Right now I am plugged in, and can run one ac unit on a 2 kva generator or 240 v, and the other on the Lithium batteries if it is really hot. Right now all I have with me is one 2.0i Honda. 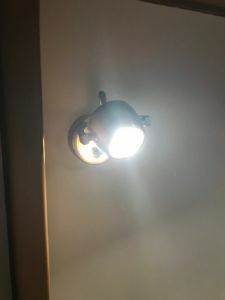 I have used it once in about three weeks, and only then because I was playing around testing how long the Lithium system would run the one air conditioning unit, and ran it down over night. 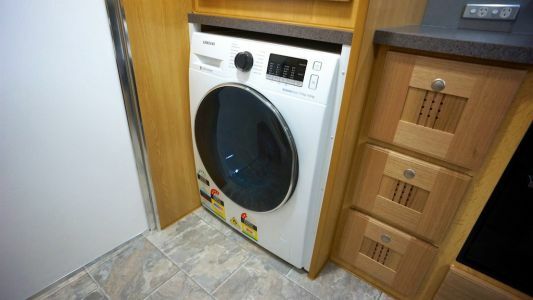 The big washing machine is too large for an inverter, unless I went to a really large combined inverter charger, and even then it is not practical Really even a short 15 minute wash cycle and two half to hour dry cycles splitting the load, would be better done on the generator or plugged in. If I was going to really hot areas, over 40 degrees, I have a second Honda 2.0i at home and can link them together so they run about 50% longer on the same fuel, hardly getting off eco-throttle. For now, I run one air conditioner off Lithium in the bush, and the other when plugged in, so I only need one power cord plugged in (I carry three). There are a lot more exotic power innovations coming in 2018. 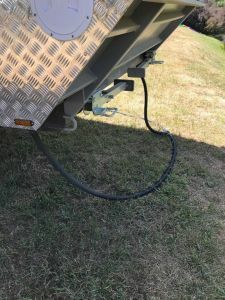 For instance while I have not done it to this truck because I have a new one in route, we have a way to get 100 amp charge from the tow vehicle even at an idle. This will be revolutionary. The Chev and Ford motors have warning about extended idle over 10 minutes or so, as the potential to glaze up the cylinders exists. However, the Cummins 6.7 litre does not seem to suffer that. 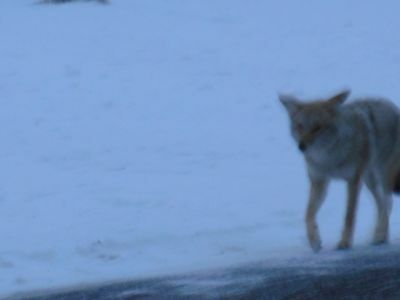 I discovered this in Yellowstone in the dead of winter, 2012-13 on expedition to see the wolves, where people were leaving the Cummins diesels idling to keep the cab warm while they were out to dinner. 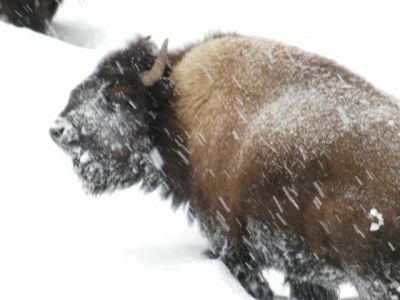 This was remarkable, in 20 below zero, and the Dodges were the only ones running. I then went to the Cummins Forum, and spoke with a Power Line Man, that spent the winter knocking ice off transformers in Montana, and he told me it was common practice all winter to leave the Dodge trucks idling. When I ask him if it shortened the live of his Cummins or caused any bad effects, he said no and said he had 200,000 miles on the Dodge Cummins Diesel. That is going on 300,000 kms, idling long term in winter. Another great advantage of the Dodge Cummins Diesel.. Anyway, because of this and a lot more research, I am going to do a 100 Amp charging system on the new truck around April. If it works, and I think it will: You could charge that way as an additional option. This will be true driving as well as at an idle, a 100 amp charge. If you Order, we admit you to the Owners Section and we will talk more about the options there. Right now, in moderate weather, I could live off the massive solar and Lithium batteries, even with air conditioning. I also have a forced air diesel heater if it gets that cold at night, but for right now I am plugged in. Out Bush I have the option of the one small generator for a laundry run, or one air conditioning unit, or both with one on Lithium. There is a bit to this, and we have to teach you how to run it all, but there is considerable flexibility and that large generator technology is virtually obsolete now..
With regard to the split power systems, if the systems can be connected together, what is incorporated to ensure the systems are synchronised prior to connection? 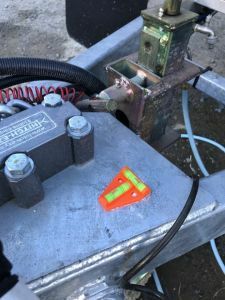 If one has a generator powering up one 240v AC system and a lithium battery powered inverter powering up the other 240v AC system, I have no doubt that you are aware that both systems must be at the same frequency and the same point in the frequency. 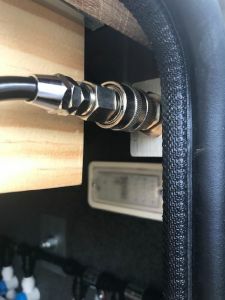 Most people would not be aware of such requirements and without protections in place it could be possible to try to connect the two out of phase, with serious consequences. 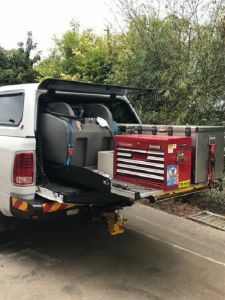 Maybe the Honda 20i would sync with the mains if the mains was plugged in first and on before starting the generator, don't know how the little honda would go carrying base load for the rest of tassie though. Seriously I don't think it can be done. I regularly sync my 2 Hondas together so I can run both the air con and the coffee machine, or a toaster, or the jug. Wouldn't dream of running it parallel to the mains though. Never tried it in parallel with the Inverter, it might sync with a local load from an Inverter. Be happy for anyone else to try and let us know. Well I am impressed that you are that switched on. Since you seem interested, here is the Science behind it (after a few whiskeys let me see if I can get this straight). I have two years of formal Electrical Engineering besides my other education to go here, and here is how it works for you in sort of Layman terms: If they were the same source it is possible, as the same source would be "In Phase" with a single phase AND single source.. That is if you ran a like a 25 amp single cord and split it one to two with a "pigtail" (Illegal in Oz).. However, if it was two cords, one side of a 3 phase power drop, and another side of 3 phase power drop, then no, it would blow sky high if connected, as they would be out of phase!! But neither is true here, as there is no, NO electrical link between the two power inlets what so ever.. So I can run two power sources, two cords, or two gen sets, or any combination. OK so far? No, like I said with the dual Potable and Non-Potable water systems as an example, it is two separate systems. There is no connection between the two. If you re-read that it is two separate systems, each side could be powered independently by gen set or mains power, or two gen sets, or two linked together for better fuel efficiency on Eco-throttle as the connection system links the Inverters of the two Hondas, but again there is no connection between the two power points after the inlet.. OK now? 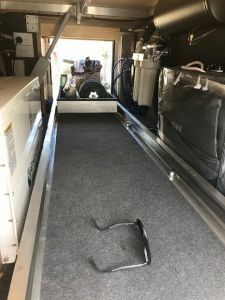 As it happens, the front air conditioning has another option, of running solely on 600 AH of Lithium, nearly self sufficiently during the day and five hours into the night. 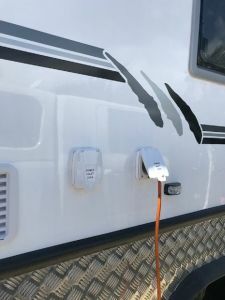 There will be more on another option, a 100 Amp charge of the new truck, in Owners Section in due course..
Maybe the above explanation has clarified this for you. There is no sharing of generator power and mains power on the same circuit. You can run one on any source, and the other on any source, as they are not hooked together anywhere. 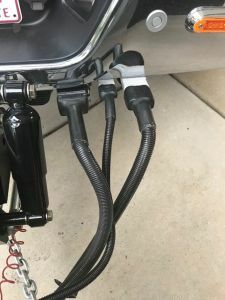 If I wanted to run both ac units at the same time I could run two Hondas, or one on the Honda and the other on the Lithium, or if somehow it was advantageous I could plug in both sides to shore power with two cords. OK now? Both of you, AJ and Rosiebear: It is a bit tricky, and we have to teach you how to run it. In mine one circuit has the washing machine and one ac unit as the Auxiliary power inlet. The other has all general power points, plus battery charger (60 amp), and the other ac unit and the 240v side of the water heater as the Main power inlet. I cannot run the air conditioning (ac) and the 60 amp charger off of a Honda 2.0i, so I have the battery charger externally switched. You have a lot of flexibility here, and we have to teach you how to run it. For instance, I have only run the Honda 2.0i once in 3 weeks to charge the batteries as I ran them all the way down to about 45% testing how long the ac unit would run at night on the Lithiums. When I hooked it up: The Honda 2.0i kept bogging down and dying.. What was I doing wrong??? Well, easy peasy, I had left the hot water 240v on, and had to switch it off, so it ran on gas automatically. Then I could run the charger and get the bulk of the charge in, then when it was down to 10-20 amps I could run ac at the same time. 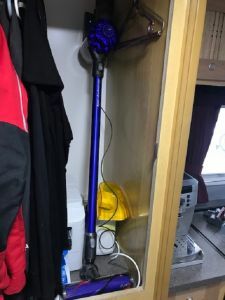 All of this has a lot of flexibility, and throw in the availability of Inverter run ac unit, and you can use ANY power source, or none of them. 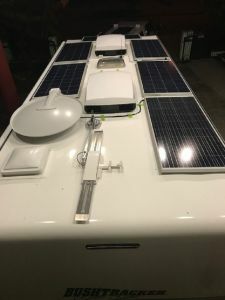 The van runs basically independently on Solar. About the only requirement for the Honda gen set, is the big washer/dryer. Otherwise you can live independently on solar for everything OK? Hot water on gas, and you are independent. I am plugged in just for the ease of it and 240v hot water, but other than laundry I could live here just on solar as well. Right now, free 240v hot water and reverse cycle air for heat at night. But I could just as easily run on Lithium for air conditioning in the day, diesel forced air heater at night, and gas hot water. The flexibility means you can use it, or choose not to OK?? More coming, like one more power source off the truck in 100 Amp, except in the extremes of weather over 40 degrees and needing 2 ac units, I am energy independent..
G'day Steve, I operated a 380MW generating unit and one of the aspects of my duties was, on a return to service of the generator I would be required to synchronise my generator with the system prior to closing on the circuit breaker. 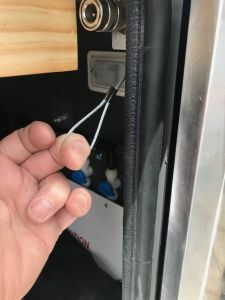 I put my post in to try to prevent anyone from connecting their portable generator to their van whilst it is connected to the grid. 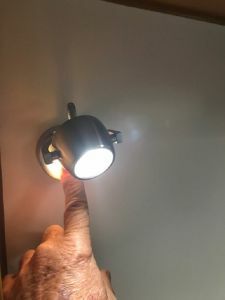 There are people who have a little knowledge and think that they can "improve" their set-up by the strangest and very dangerous ways. Thank you for adding to the conversation. 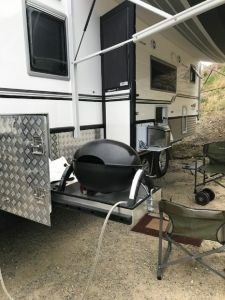 There are countless little bits of custom work I have added on.. Like for instance on this Ziegler and Blacke BBQ, I did something that many might like. First of all this Ziegler and Black seems better than the Weber BBQ. 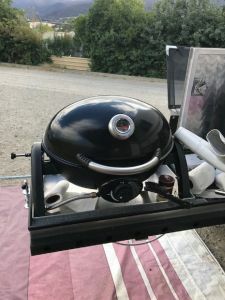 Here you see it with the lid up, and then the lid folded down underneath of it, and the burner and controls seem to work better..
Now I am not selling BBQs, this is just a matter of interest. It does work really well and the temperature guage works very well too.. Now if you look, here is one of my personal innovations: Look carefully, it is not actually bolted down to the cargo hold slide, it is sitting in its own alloy tray, bolted down in there, a snug fit into the slide out cargo hold storage. This gives me the option of taking out the tray and BBQ and moving it somewhere else to BBQ OK? I don't know how much to keep putting on here. The little custom bits are here by the hundreds. For those that do not know our normal quality, you can have a peek in the Category above titled Sooo... Why is Bushtracker the Best? 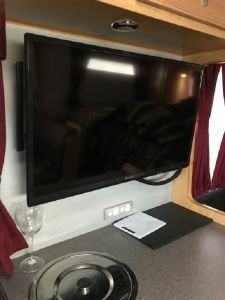 And a good place to start is the Topic: "A Peek at the Unsurpassed Quality You will See on Tour"
Anyway, I don't want to bore you all with all the little details. When I am back in February, you are all Welcome to have more of a look at my own van when you come for a visit. There are countless little things, like this silly little Bunnings level gauge I put on the a-frame.. This might be my last Post on this van, unless there are questions.. I want to emphasize that size matters. I mean if you want the Mega Land Yacht type of Lifestyle, size of van and size of tow vehicle matters.. Here I am in an idyllic spot in a park in the middle of Tasmania, and it is so nice I have decided to stay an extra night. I have unlimited power and water and a grey water dump, in a Park, for $20 a night. 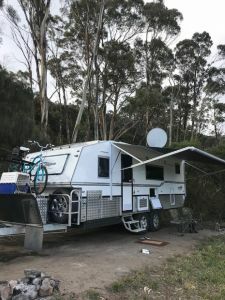 Now there are plenty of free camping spots in Tasmania, but here I get to use my own Laundry, washing machine on board, that turns into a dryer. I am also walking distance to a nice little Artist type town of galleries and nice cafes and restaurants in Deloraine Tasmania. I don't have to go looking for laundry, I can do it at my leisure. And here is a personal invention, I have made up a two to one sullage hose, and can run it either direction, off my laundry and the normal grey water tank both at the same time. It can swap and go out the other direction. 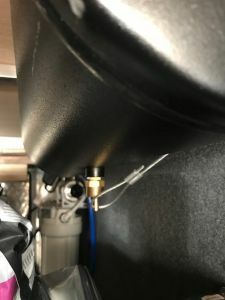 When I get home, I might see if it can be plumbed into the grey water tank, it would maybe clean it all out in the process... For right now we assumed it would have to run separately so I made up this 2 to 1 sullage hose. Anyway, for the extremes of luxury living, SIZE MATTERS. The full Air Suspension again levels me, backed into a slope. I jacked up the the rear of the van on air. 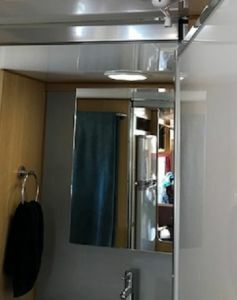 And my own 7.5 kg washing machine that turns into a dryer right here on board, this is the ultimate in independent luxury living. 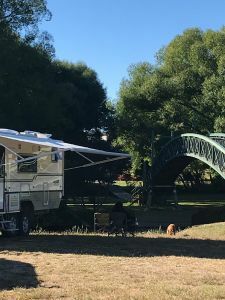 I could do the same thing out Bush running the generator, but for $20 I can stop in an Artist Colony town, stay in the Park, walk to shops and cafes and restaurants, and do laundry and sheets in the convenience of my own van. Size matters !! 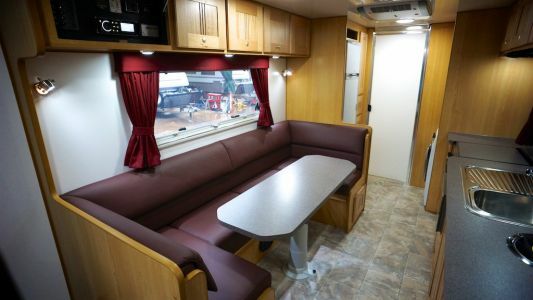 This is only for larger tow vehicles and larger vans, and I think you would need the full Air Suspension to preserve the big washing machine on the corrugation, and off-road, but this is a treat. Home away from home. 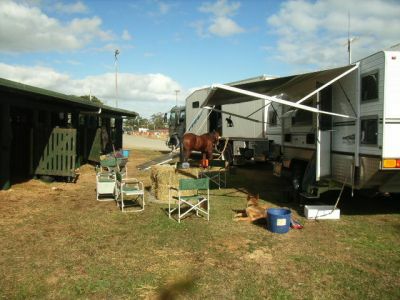 Size does matter for this kind of luxury and lifestyle..
Kind regards, Steven Gibbs, Director, off in Tasmania. One more little thing, a must have, is the Forced Air Diesel Heater.. I just thought of it, appreciating it this morning!! You would not want to be without it. Right now, I thought Tasmania would be a bit warmer being "Summer", but no, this is like a Queensland winter.. Off power, like I am up in the Northwest Tasmania, it is down in the 10 C range and can get colder than that. I have seen 6 C... The floor is insulated, and off power it is so nice to get up to a toasty warm van for a few liters of diesel.. I write this sitting barefooted in my nice warm Bushtracker this morning. Talk more with us on this and about 50 other things when visit..
You want to know what features stand out for me, with all the innovations I am trying? Well it is my pleasure to show you. I have to say, this is the greatest van (for my choices) that I have ever built. 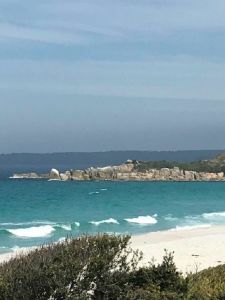 A second month in Tasmania, a week now in the wilderness of Western Tasmania, and yes there are some real stand outs that I will always want to have.. Here are a few of them..
Big on power: I am so energy independent I really have no concerns over power. I have spent the entire week so far in the west wilderness area of Tasmania without running a generator or hooking up to anything. I can run the lights all night, the diesel heater all night, coffee maker, microwave, and I hardly dent the power reserves. After two days of rain, Satellite TV and DVDs til 11 at night, security lights on all night, I am only down to 75% this morning. Here is another surprise, just how much I like the full Air Suspension: If you have the tow vehicle to take the extra weight, with a big van like this the full Air Suspension is magic.. Tasmania is overcrowded, and this has allowed me to put the van into places that others could not use because of the steep terrain. Here are just two examples of the extremes of leveling that would be hard to accomplish without this set up, and gave me a MAGIC spot in crowded circumstances OK? Here I am in a tent camping spot between two fire pits. 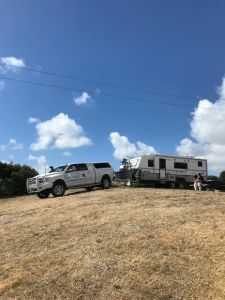 To avoid the fire pits I am up on the slope on the back side with the air let out to put me down on the bump stops because of the slope.. As you see this I am level, with the near side pumped up all the way, and a fantastic view, the best in this free camp with a view of the ocean.. It was a little trouble to back in there on this slope, but a far better view. It would have been near impossible to do this with blocks of wood and such to level out this extreme, but was easy to play with the full Air Suspension OK? Here is another example: Free Camps fill up and even in the remote regions of the West Coast they are overcrowded. The tent campers and vans filled in all of the easy access flat areas. Without my ability for extreme leveling we would not have been able to stay. I guess it comes down to "size matters" of both Bushtracker and of course the tow vehicle to pull it. Another stand out example is water supply. Because of the size at 23', I have seven tanks of water. I can easily go more than a week. This is a week out on the west coast wilderness, and I still have three tanks of water, and of course probably 3/4 of a tank of drinking water that I could also use in a pinch pumping some over to tanks for showers. We could go two weeks with reasonably short showers, and a month on drinking water, more on rationing with two stage showers of washing and rinsing. The really big lounge for four people has been a standout. 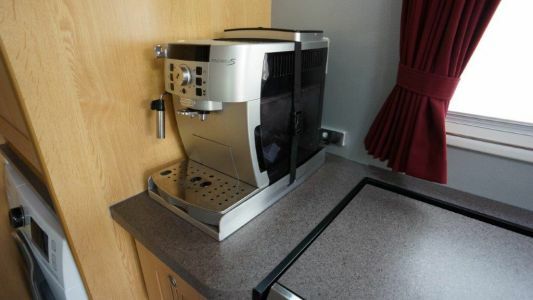 Also the Yacht style counter drop through into a full sized kitchen waste can and the coffee maker have made the size increase really nice. I would do it all again. I am surprised, everything has worked out magnificently. "Size Matters" for this kind of luxury and possibilities, and if you have the tow vehicle to match. 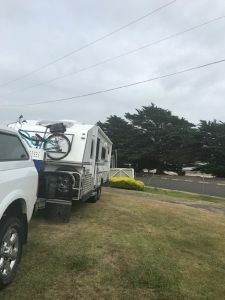 I could live in this van permanently..
Kind regards from Western Tasmania, maybe off to Cradle Mountain tomorrow..
Our 2 non potable tanks last 10 days and that includes showers every day. Have never run out of potable. But I am spoiled and I have a spoilt Wife and we like good regular hot showers, particularly in this cold weather... It is a different level of luxury Grumpy. 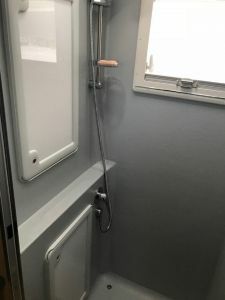 Big Luxury... Not severe rationing one- two minute showers or every other day like in remote regions of the Outback. Most Bushtracker Owners are running 3-4 tanks of non-potable water these days..
We were poor Street Kids. We have done it tough, and didn't like it nearly as much as now.. I have been in Tasmania since the beginning of December. It is often over crowded, particularly the "free-camps".. Thanks to my full Air Suspension, again I got the best spot to camp. Everyone was packed into the small flat area, and then it fell away at a slope in the foreground. I got to park on the nice grass with a great view because the extremes of the Air Suspension. 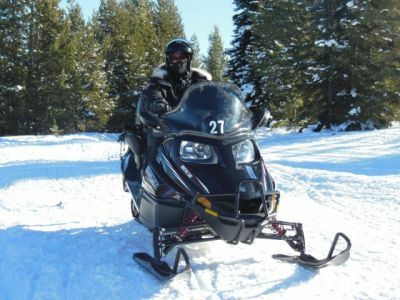 It allowed me to be there with the high side down on the stops, and the low side pumped up all the way to about 80 psi. I was level sideways on the slope. 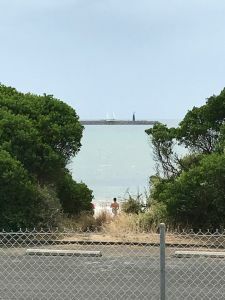 This would have been very hard to block up, so I had privacy and the best view in the area. My full Air Suspension has greatly increased in practical value to me. 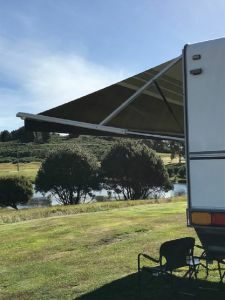 It has proven to be a whole new dimension of freedom in these over crowded camping spots, and saved me most of the time in Western Tasmania. I could still find room, in the over-crowded camps, because I could go where they could not, even tent people could not go on the extreme slopes. The spots were open to me, because they were beyond a bag of blocks and plastic ramps for leveling, so I got them to myself courtesy of the range of my Air Suspension. Never before has this been so important and now I will not be without it. 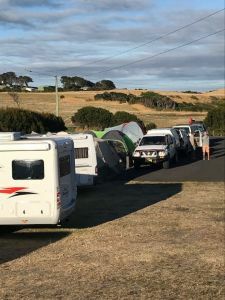 Better to get off on your own in discovered privacy, as the Wiki-Camps sort of places are all way overcrowded in Tasmania. 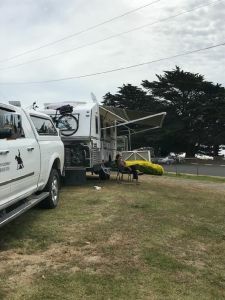 For any of you Owners, I have a very active Topic in the Owners Section, on my impressions and experience like this in Tasmania. Never before has the leveling range been so important to me, as here in Tassie. If I had not been able to do this with the air suspension, I would not have been able to stay, or had an unpleasant time in many of the camps. 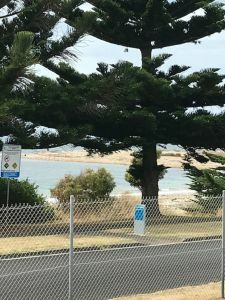 In fact, about half the time, it gave me the BEST spot with a view, just because I could level up where they could not go..
Best regards, lone Ranger in Tassie.. This might be my last Post on this Thread unless there are anymore questions. Now no one took this spot, because as you can see in the first picture it is about say 300 mm out of level, side to side with the van. It would have been very difficult if not dangerous to block it up with timber and plastic wedges.. Now this is only for the very large Mega Land Yachts OK? 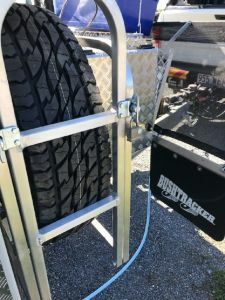 Smaller Bushtrackers are easy to block up and it is not worth the added expense and weight of the full Air Suspension on a smaller Bushtracker. OK with that? The second picture shows the range of the full Air Suspension in saving the day again. Tasmania would have been difficult for me at best without it.. 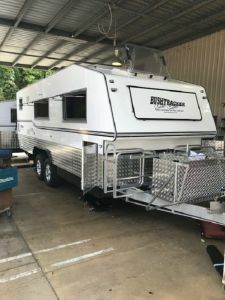 If you do go for a Mega Land Yacht sized Bushtracker and the full Air Suspension, here is another thing you should definitely get. 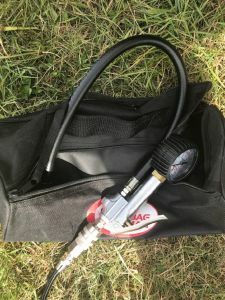 It is a kit that plugs into the air tank and pump, to fill tyres. Now in all fairness, it came in VERY handy. I have the right rear tyre losing a small amount of air, like maybe 10 psi a week. I cannot find it, but there is a minute screw or nail hole it in, and I am not fixing it until I get back as I have a Dodge Ram tyre monitor built into the system with an alarm. But anyway, this is a tight coil hose, air filler and gauge and I USE IT !! I have enjoyed reading about all the features of your Land Yacht and your comments regarding the air suspension. We are currently deciding on what size BT we would like to purchase. 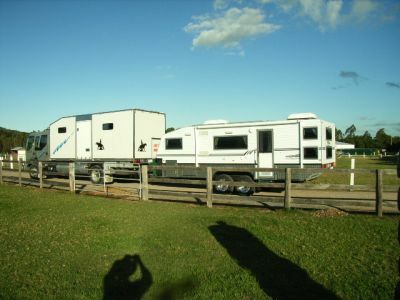 Our current rig that we have is seven years old and from day one we had air suspension. We love it and would not consider a replacement package with out it!! At the end of the day it takes only a minute to have a totally level rig. We always bush camp and have only once needed to use blocks under a wheel. 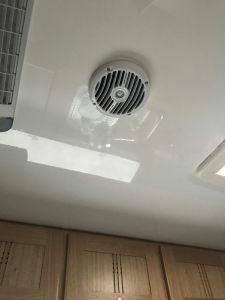 Another great feature is you carry your own air supply that can be used for an eye watering array of jobs. I am not convinced that the air suspension should only be used on the mega land yachts. If the cost is within the budget and extra weight is not excessive it will be on my order with BT. A man lucky enough to live near a river.........is lucky enough! Look, come for a visit to Bushtracker, don't guess, you need to see the REAL THING.. Seriously, our full Air Suspension will be superior to anything you have seen, as well as about 50 other things at Bushtracker..
4140 Tool Steel Axles 60 Ton Tensile, Camber as well and Toe in Tow out adjustment, Firestone Air Bags with retainers so they do not over extend, this and 50 other things will show you why we are Number One in Australia.. Come for the visit: Call first and make an appointment, so we can reserve the time for you..
As to the full Air Suspension on smaller vans: Look, you can always have what you can afford to do.. !! I just do not want others to think it is a necessity OK? It is a LUXURY, and certainly not a necessity. If they can afford it, if they can afford the weight, then I am here to show them the advantages. Luxury, not necessity!! And one more thing: WELCOME TO THE FORUM, POST NUMBER ONE !! 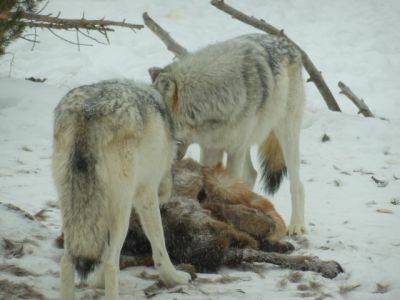 On expedition to Yellowstone to see the wolves up close in the dead of winter Jan 2013, I quickly learned that the Dodge Ram Cummins diesel could idle long term. At 20 below 0, at one of the only restaurants open in the winter, there was steam rising from a few of the trucks parked up.. I walked down to see if they were in trouble or something, but they were all Dodges in the parking area, the only truck sitting at an idle staying warm while the people were inside having dinner. I walked by, crunch crunch, and only the Dodges were running. I then went to the Cummins Forum, and spoke with a Power Line Man, that spent the winter knocking ice off transformers in Montana, and he told me it was common practice all winter to leave the Dodge trucks idling. When I ask him if it shortened the live of his Cummins or caused any bad effects, he said no and said he had 200,000 miles on the Dodge Cummins Diesel. That is going on 300,000 kms, idling long term in winter. Another great advantage of the Dodge Cummins Diesel.. Right now, in moderate weather, I could live off the massive solar and Lithium batteries, even with air conditioning. 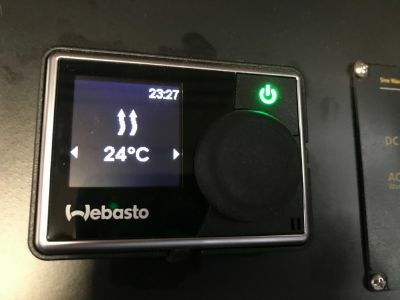 Another new invention is we have an additional relay that trips off the air conditioning when the Lithium batteries get down to 50% so I can leave it on at night and not go off on LVD by morning as this would shut down the refrigeration and water and lights. This new relay system will just turn off the air conditioning when the Lithium gets down to 50%. Here is the next stage to all of this, 80-100 amp charge off the Dodge Ram! 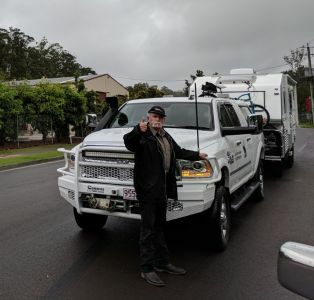 There is a bit to this, but there is considerable flexibility in that large generator technology is virtually obsolete now.. At least in the larger Mega sized Bushtracker that can carry such a large solar array and 600 AH of Lithium, and of course with the Dodge Ram Cummins Diesel. We can now charge the Lithiums at an idle.. It requires 35mm size battery cable in conduit, and 175 amp Anderson Plug. There is a bit to it, but wow, does it work well so far! 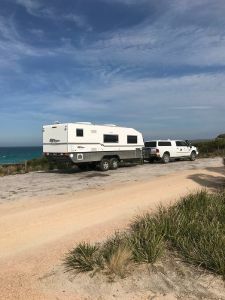 Now this is waaay out there on the end of Mega Land Yachts, it is not applicable for smaller Bushtrackers and tow vehicles OK. My new truck is here, about 1100 kms on it so far, getting run in. I have done what I have been talking about, and direct run off the large alternator to two DC to DC chargers, and it works. I am getting 86 amps of charge to the Lithium batteries, at an idle!! 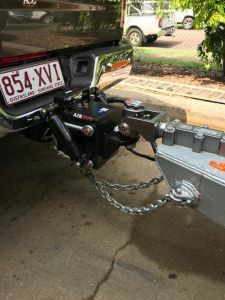 This is on the verge of making generators obsolete..
Now you can only do this with a Cummins diesel, and a larger Mega Yacht Bushtracker. I am running 600 AH of Lithium batteries and 6 - 150 watt panels. And on expedition, I discovered the Cummins can idle long term. We have a way to approach getting 100 amp charge from the tow vehicle at an idle. This will be revolutionary. I will be going on two fair sized expeditions this year, at least. 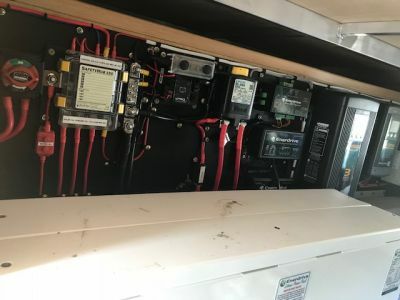 We will see if there are any heat dissipation problems with the 2 DC to DC chargers, tuned to about 45 amps each, and the alternator of course on the Cummins 6.7.. This is REAL R&D out on the edge of things!! I will report on the progress later in the year, there is a Topic on this in the R&D Section..
Steve are you running dual alternators on the new RAM? No, one single large alternator.. Most of the imports that have dual alternators, lose one in the conversion process. Because of the superior conversion of SCD the engine compartment stays original as does the entire steering system.. Mine has a 220 amp alternator. With less than 50% of capacity, I do not think the 86 amp charge we have measured is much of a threat to the heat sink on the alternator. No it is not continuous duty, and that is the risk, we will just see how we go. Also the DC to DC chargers will get a bit hot and there could be heat degradation there. 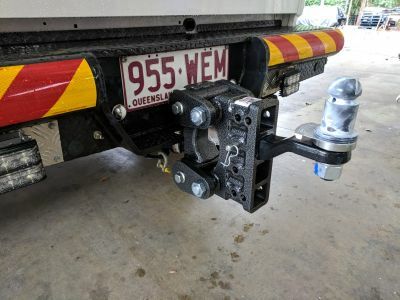 This is why it is called R&D, and why we will not install it on another Bushtracker until we get a good run out of this set up or modify it to suit. Saw Steve and the big Rig at Stanley Tassie as we were fueling up,great looking gear. Just sold our hybrid after coming back and trying to afford an 18ft Bushtracker. 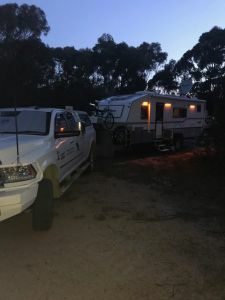 We really appreciate the information you have provided about possibilities in designing Bushtrackers and we have taken most, if not all, wherever possible on board with our planning. 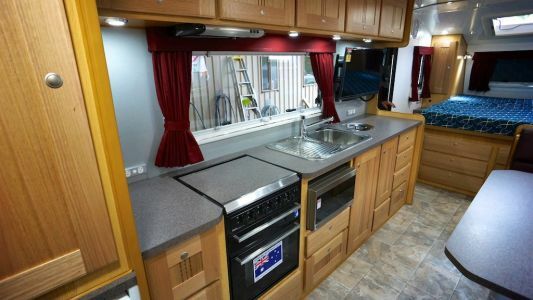 You mentioned above that as your van has the raised roof with the BIIIG overhead cupboards, that you were going to consider putting shelves in all or some of the Overhead Cupboards when you returned from Tasmania. 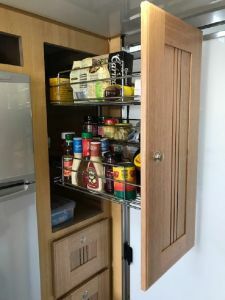 Wondering if you have given any further thought to this and if you did finish up putting shelves in any or all of the overhead cupboards. 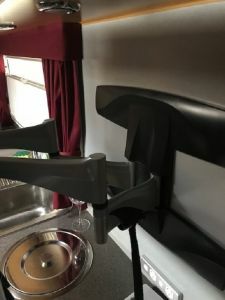 You are always rearranging things, changing wine glasses, deciding to put them back in their original box for travel, getting a taller this or that or something else... After a few months in my new Bushtracker I decided not to bother..